The pinnacle of K9 sporting prowess came to a head for the inaugural 2018 Common Woof Games which launched into action in the ROYAL CANIN® Arena, featuring some of Australia’s most talented sporting K9s in action! The ROYAL CANIN® Arena hosted by none other than Dave Graham, was once again a huge success bringing together the most elite four-legged sporting talents in Australia, representing four countries across the Commonwealth competing across ball-sports and track and field events that will excite and inspire the whole family! There were no show-ponies in the Common Woof Games, these K9 talents were primed for pole pawsition having only one mission in mind – score as many goals as they could in a nonstop, blink-and-you’d-miss-it shootout. Gravity-defying and awe-inspiring, these spring-loaded athletes scaled a wall in rapid-fire form. It was fast-paced, exhilarating and had you on the edge of your seat cheering them on. This was one sport notorious for favouring six-footers, but not in the Common Woof Games. In a game of skill – the Michael Jordan’s, LeBron James’s and Stephen Curry’s of the dog world showed off some hoop-time in a shoot-out guaranteed having the NBA’s draft selectors scouting! Endurance, speed and accuracy are the secret formula for success. These incredible dogs coordinated not two, but four lead and trail legs without missing a beat, judging the exact moment to take-off efficiently and aerodynamically and make it home as the winning woofer. Ragnar Lothbrok called and wanted his Viking warrior dogs back. Poached straight from the training grounds of the elite, these tough-as-nails woofletes ducked, weaved and raced though blunt javelins released by their human coaches against the clock! There ain’t no cowboys here – these courageous and clever Common Woof canines didn’t sweat the small stuff as they traversed three barrels in a clover-leaf pattern defying time and circling just centimetres away from penalties. If you’ve ever tried to catch a Malteser with your mouth you will understand the challenge of eye-mouth coordination. Well, imagine a world where your hands are your mouth, and admire these incredibly coordinated K9’s as they caught as many frisbees as possible against the clock. Watch as they ducked and weaved and found optimum position – primed for the mark-of-the-moment in a bid to secure the gold medal! The All Nations 10 metre Puppy Sprint was the cutest canine comPawtition on earth! Audiences cheered on these little racing representative champions of their homelands as they raced down the main arena in a furry flurry of big feet, floppy ears and a photo finish that broke the internet! Dr Katrina together with the incredible Wonderdogs will officially launch the Common Woof Games. Showcasing their talent and offering spectacular and uplifting entertainment, The Wonderdogs will kick off an action packed day of events on the ROYAL CANIN® Arena. The 4 Paws Sports team are back for 2018 to compete in the Common Woof Games with the Incredible Dog High Jump! These highly trained sports dogs will challenge their leaping skills to the limit inch by inch. This style of high jump has never been attempted in Australia before. Come along and support our diverse range of dog breeds and sizes to see who will achieve the gold medal height. Presented by Dave Graham and his band of K9 superstars, the Common Woof Games kicks off in spectacular style! Round one kicks off with all the action of Dog Socca- a goal fuelled ball sport, gravity-defying dogs scale a vertical wall in the jaw dropping Dog Vault, and proving that heart is more important than size, our favourite pint-sized pups have a solid crack at the Mini-Dog Hurdles. Co-hosted by Australia’s adored Dr Harry Cooper making his first appearance at the Brisbane Dog Lovers Show, The Common Woof Games continues with the woofing league taking on three pointers in Dog Basketball, dodging and ducking with the most nimble prowess in the Javelin Weave, spinning and sliding against the clock in the Barrel Race, and showing us the epitome of hand-mouth coordination in the high-octane Discus throw! The Wonderdogs showcase their sporting prowess and show why they are top of their game. They will demonstrate their athletic ability, gymnastics routines and show off their incredible ball skills. They’ll wow you with their clever antics and favourite tricks – guaranteed to make you smile! Popular television vet, Dr Katrina Warren has teamed up with professional trainer, Kelly Gill and the Wonderdogs; a team of impeccably trained chocolate border collies. The Wonderdogs are seasoned performers and have appeared with Katrina on the Today Show, Morning Show, Funniest Home Videos, Saturday Disney and Talk to the Animals. They have also starred in numerous TV commercials and feature films and it’s a very rare opportunity to see them all perform here at the show in Melbourne. Dr Harry co-hosts with Dave Graham – and is ready for all the action of the first of the Common Woof Games finals! Having had a quick recovery session, our K9 athletes have regrouped with new tactics as they vie for podium position and their chance at a gold medal! 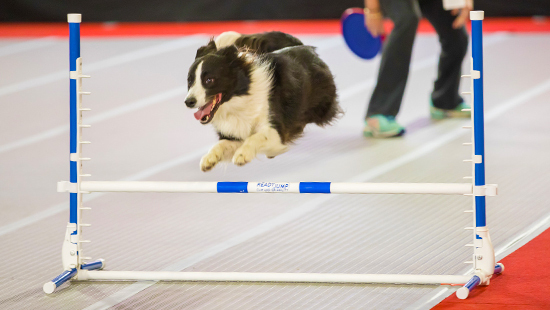 Our Dog Socca challengers are back with some fancy footwork and the tiny tackers will impress you with their speed and agility in the Mini-Dog Hurdles! Dave Graham knows dogs. He’s bred, raised, trained, coached and loved tens of thousands of dogs throughout Australia and around the world. From National Champion, Indian Street Dogs, Wild Dingoes, International (Performing) Stars to the best little work mates to keep a stockman company; this fun loving larrikin has worked with a huge variety of dogs in his time and brings his unique hosting style and abundant love for dogs to the 2018 Dog Lovers Show. The stakes are high as the medal ceremony looms- our pawthletes have regrouped from their mornings sessions, debriefed and are ready to go head to head for Gold, Silver and Bronze. Don’t miss the point shooting in the Dog Basketball, some seriously slick skidding and spinning action in the Javelin Weave, the blink-and-you’ll miss it action of the Barrel Racing and fun of the Discus Throw! After a challenging day, our amazing athletes are back to reap the rewards of all their training and their inspiring performances. Don’t miss our moving closing ceremony, and make sure you are trackside with your singing voices as our heroes present for the national anthem and receive their rewards!